In 1998 a group of artists organised a collective to put on a unique show at the Candid Arts Trust in Angel, Islington. What brought us together was a common interest in glass; working with the material and exploring its properties as a light transmitting substance in relation to the space surrounding it. Tired of the limitations of the gallery where our work would be labelled either “Art” or “Craft”, we tookmatters into our own hands and sought out an interesting space where we could control the lighting and the placement of our work. We deliberately scheduled the show to coincide with the Jerwood Prize exhibition at the Crafts Council, just down the road. It represented a kind of Salon des Refusés that showed an alternative to the kind of pristine and soulless white plinth mentality of the establishment. 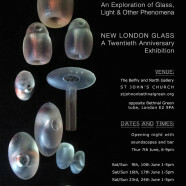 We calledourselves “New London Glass” as if to announce the intention of starting with a freshperspective, and freeing ourselves from the preconceptions of what glass art should be. From this auspicious beginning, our group went on to curate successful shows for the Platform for Art in Gloucester Road Underground Station, The Great Eastern Hotel, Liverpool Street and a wonderful touring show in collaboration with Hungarian artists that visited Budapest, Bruges and Rotterdam as well as London and Liverpool in the early years of the noughties. Twenty years later, many of the same challenges exist, some of which have become more difficult. Exciting shows that include artists working with glass are hard to come by and spaces to exhibit have become even more costly. These hurdles affect artists in many ways and make it difficult to create work that takes risks. Galleries too are affected by these challenges and often see glass installations as problematic rather than an opportunity to show work that explores the fascinating qualities of the material. Many of our colleagues have been working outside of the established gallery circuit since we last showed together. Some are architectural artists working mostly to commission, some have had children, others went into teaching or academia, some moved away from London to continue their practice in a more sustainable environment. Yet all of us have retained our passion for glass and our ambition to produce thought-provoking and visually stimulating work in glass and light responsive materials. In celebration of our twentieth anniversary, the core members of NLG met up and decided to mark the occasion with an exhibition. We tracked down many of our old colleagues and found some new artists keen to exhibit. We found a wonderful space to show in the atmospheric belfry of a neoclassical church right above Bethnal Green Tube Station. Working with light, glass and sound our artists are creating a Cabinet of Wonders in this dark space. We are also spilling out into the staircase leading up to and inhabiting the daylight-flooded North gallery running alongside the belfry. Gaby Kienle: floating clouds of crystalline droplets. Helen Maurer: a captivating sound piece using wine glasses and spoons; inspired by a board in the Nave of prayers for the sick and the departed, and the ritual of tapping a glass to gain attention. Helen also shows a piece capturing the movements of dichroic light patterns dancing on the walls of the Belfry. Anne Petters: fragile leaves of crushed crystal, embossed with delicate writing like the fluttering pages of a book caught in a breeze. All these marvels will be available to peruse on the first Thursday evening of June and the three following weekends from 1pm till 5pm. We have also invited DJs to compose a complementary sonic landscape to accompany the show and we will have a bar in the nave of the church on the opening night.